This is a very easy and tasty recipe that requires little effort. Use the whole fish and make sure to pick one that’s really, really fresh. Preheat your oven to 400 degrees, then grease a 9×13-inch baking dish with about 1 teaspoon olive oil. 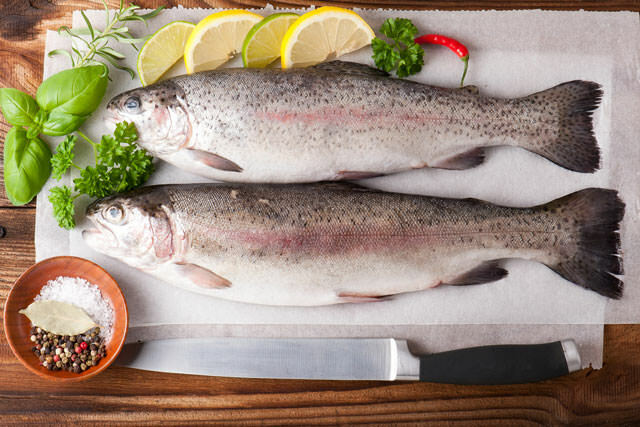 Place the trout into the prepared baking dish and coat with what is left of the olive oil. Season the inside as well as the outside of the fish with dill, thyme, and salt. Stuff each fish with onion slices, and grind some pepper over the top. Place 2 lemon slices on each fish. Bake in the preheated oven for 10 minutes, then add water to the dish. Keep on baking until the meat flakes easily with a fork, which is about 10 additional minutes.